The Optics and Calibration Lab at San Francisco’s Hunter’s Point hosts what was once the world’s tallest industrial lift, now abandoned and the site of a superfund cleanup effort (photo copyright Jon Haeber). See also incredible photos of the same escalator by Todd Lapin. In Coney Island, we saw some of the most bizarre rides invented. There was “The Jump” — a parachuting thrill spurred on by the military industrial complex. The Jump was modified from its inception as a military paratrooper training aid to the delight of many-a-Coney-Island visitors. Remarkably nobody died in its three-decade stint as a ride. There, too, was the Human Roulette Wheel in the Steeplechase Park section of Coney. This bizarre contraption spun like a washing machine, kinetically throwing outside stragglers to the mercy of momentum! Poor, poor souls. Some Coney Island attractions survived and we may little take notice of their auspicious beginnings. One is ingrained in our culture so much now that we don’t even realize that it was invented as an amusement park ride. It was in 1892 that Jesse W. Reno invented the “inclined elevator.” There had been earlier patents, but none come to fruition as Reno’s escalator had. At first, Reno went to New York with a grand scheme for the city’s subway system. A recent graduate of Lehigh University, he had been toying around with the idea of moving stairs since the early age of 16. Reno’s 1902 patent for an escalator. The word comes from the Latin for ‘steps’ (scala) and ‘elevator’ (which had been invented 50 years prior). Reno approached the city of New York in the Spring of 1896 with the idea of a double-decker subway system, complete with inclined escalators. The city rejected his plans, so he opted to give the escalators a whirl at Coney Island. And whirl it did! Seventy-thousand patrons crowded its steps for its two week stay at the Island. But Reno had bigger plans. He wanted the escalator to be used for practical purposes. So, in 1902, he founded Reno Electric Stairways, Ltd. Some of his greatest ideas came during this era. Only four years after he formed his company, he was toying around with the idea of spiral escalators, and the London Underground had comissioned the world’s first spiral escalator at the Holloway Road Station for the Great Northern, Picadilly, and Brampton Railway. The Halloway spiral escalator was a thing of beauty to behold — and over 80 years ahead of its time — but it didn’t last long. Sadly, Reno’s spiral escalator never went into operation. London authorities never approved its use due to safety reasons. Fast forward 90 years, and an odd contraption is discovered at the bottom of an abandoned tube at London’s Holloway Station. 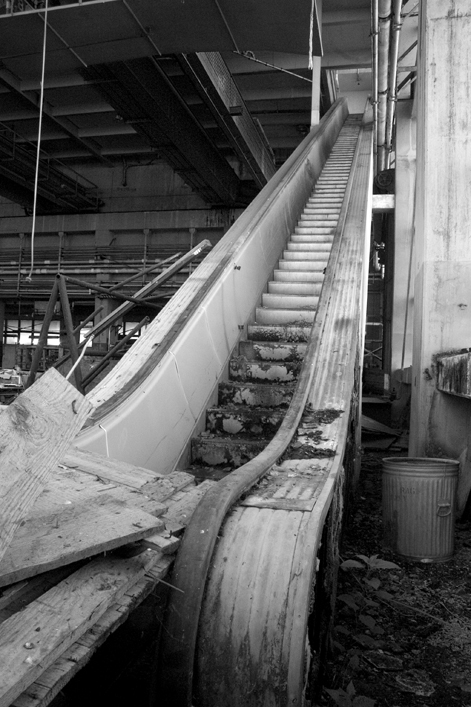 Reno’s escalator had been sitting there for 90 years, virtually untouched. The London Transport Museum recovered the components of the “world’s first spiral escalator” and now have them on display. A portion of the Reno’s spiral escalator invention, which had remained undiscovered lost in the London Underground for 90 years. The 1950s saw a boom in escalator production. Yes, there was a whole industry devoted to the appreciation of these people moving wonders. In fact, there was even a monthly full-color journal devoted to them and their couterpart elevators. Even the government caught on to the furor. Government buildings, municipal subway systems, and yes, even the Navy’s own 1948 Optics and Calibration Lab used escalators to their advantage. The Optics and Calibration lab used its escalators to transport naval workers up its three-story, 42-foot rise. Not only do these moving stairways speed up the work flow, they also look really, really cool! Today, Hong Kong boasts the largest escalator system in the world. A half-mile of twisting, winding, contorting tracks slithering through the urban landscape as it makes its way from shopping mall, to condominum, to office, and back again. In the future, who knows what role escalators will play. This entry was posted on Wednesday, May 16th, 2007 at 12:45 pm	and is filed under Built Environment, Uncategorized. You can follow any responses to this entry through the RSS 2.0 feed. You can skip to the end and leave a response. Pinging is currently not allowed. Very nice information about the escalator history. Quite interesting that Reno’s 1902 patent for an escalator. I have a new idea to make escalators as small as an elevator. I saw your article, However I want to know more about your research in this are. I will be happy if you let me know how shall I introduce my idea to escalator producers and fabricators.